"My dad loves to barbecue and this is his own creation. It's absolutely delicious and goes with a variety of meats. It makes a lot, but keeps well in the ice box and it's nice to have it on hand instead of store bought sauce." In a large saucepan brown bacon until crispy and discard excess grease. Add onions and cook for a few minutes until wilted. Combine soy sauce, garlic, tomato puree, corn syrup, molasses, brown sugar and liquid smoke. Add to bacon and onion in the saucepan. Season with chili powder, mustard, paprika, cayenne, ground cloves, bay leaf and salt. Bring to a boil, reduce heat and simmer for 45 minutes to 1 hour. 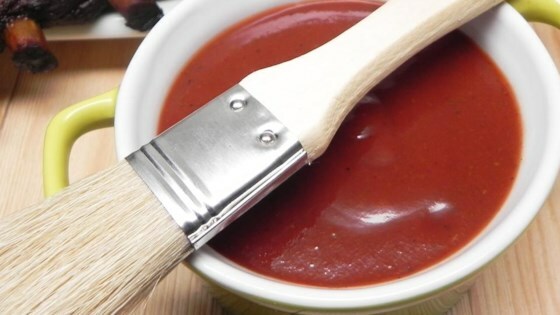 The perfect BBQ sauce recipe, ready to make right at home. Didn't taste good to us and we are pretty non picky eaters. Sorry, hope the rest of you have better luck. I made 96 servings canned 8 qts Jars. I added 1 cup of vinegar, Cider Allspice & ground clove 1tablesoon each. Tried this out for a BBQ Chicken Pizza, absolutely delicious! I thought this sauce was delicious! Thank You SO much!